You never know what will happen in our K-5 Scholastic tournaments. They have some of the truly most suspenseful games you have ever seen. The evaluations of the games can change back and forth at any moment. As usual, a few young stars were able to avoid disaster and finished ahead of the pack. The members of the CCFC Dream Team put in a strong showing winning first and second place in both the K-2 and 3-5 sections! In the K-2 section Dream Teamer Ryan Roderick finished in first place with 3.5/4 points. He was followed closely teammate by Tegh Singh. 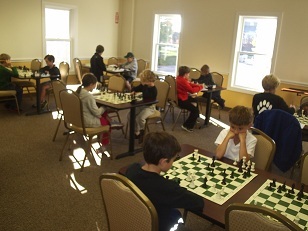 The 3 – 5 section was won by Alex Mayo with a perfect 4/4. Alex entered the tournament as the 6th seed and defeated higher rated opponents in every round! He picked up an astonishing 307 points! In sole second place, a full point behind was Bryan Weisz, another member of the Dream Team who also had a strong showing.